There are lots of things to remember and to maintain on an RV. Sometimes we tend to overlook the simplest maintenance requirements on our RV. As the old saying goes, you can’t see the forest for the trees. These simple oversights can result in costly repair bills to correct the problem too. Let’s take a look at some common RV owner maintenance mishaps. 1) Checking and adding air when the tires are hot. I see it all the time, people checking their tire pressure when the tires are hot. You should always check and inflate tires when the tires are cold, before traveling more than one mile. Hot air expands and will give you a false reading. If the tires are already hot wait several hours before checking and adjusting inflation pressure. 2) Neglecting to periodically check the water level in batteries. 85% of lead acid batteries manufactured in the U.S. die before they should. One of the leading causes for battery failure is overcharging the battery. Overcharging a battery results in severe water loss and plate corrosion. This is a common problem with RV’s. The RV converter has a built in battery charger and most RV owners are under the impression that if you leave the RV plugged in when the RV is in storage it will keep the batteries topped off. While keeping batteries topped off is extremely important the problem is that many, but not all, RV converter chargers provide a constant charge of about 13.5 volts which is too high for fully charged batteries and the electrolyte is boiled off resulting in an early death for the batteries. There have been advances in converter charger technology and many of today’s converter chargers are 3 stage chargers that will prevent batteries from overcharging. Another problem is during times of high battery usage and recharging the electrolyte is boiled off. Periodically checking and adjusting the water level in the batteries can save and extend the life expectancy of the battery. When you add water use mineral free water. Distilled water is best and only fill the battery cell to 1/8 inch below the vent well. 3) Not rinsing and flushing the black water holding tank after you empty it. The only way to get a long service-free life from the RV black water holding tank is to rinse and flush the tank after you empty it. 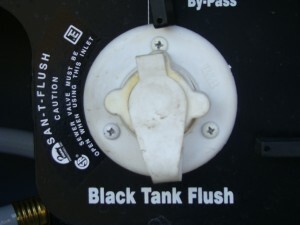 Some RVs have a built in system for flushing the black water tank, but many don’t. If your RV doesn’t have a built in flushing system there are aftermarket products like tank cleaning wands and reverse flush valves that will assist in keeping your black water tank clean, clog-free and odor-free. Watch a short video on tank cleaning products. Watch a short RV tank cleaning products video. 4) Not performing pre-departure checks. I think nearly every RVer, at one time or another has learned this valuable lesson. Pre-departure checks or a final walk-around before leaving can save you costly repair bills. Common RV repairs relating to this are repairs to the steps, TV antenna, awnings and power cords. Take a minute to walk around the RV, and look on top and underneath before heading out. 5) Not periodically inspecting your RV for water damage. Water leaks on an RV can cause extensive damage and can be extremely costly to repair. To protect your investment and your wallet you need to take the time to inspect the RV for water leaks. The outside of your RV may look fine but the internal damage caused by water over a period of time can result in the entire roof, floor or wall rotting away without you even knowing it, until it’s too late. To prevent a leak before it starts thoroughly inspect all roof and body seams, sealants and around any openings cut in the RV roof or sidewalls. Reseal any seams or sealants that show signs of cracking or separation. Consult your RV owner manual for inspection intervals and for the type of sealants compatible with different types of materials. 6) Not performing routine safety checks. It’s not uncommon for RV’s to sit in storage for periods of time. If dry cell batteries aren’t removed from devices like smoke detectors and carbon monoxide detectors the devices won’t work when you need them. By simply getting in a habit of checking the smoke, CO, and LP gas leak detectors prior to each trip you can prevent this from happening. Follow the testing instructions in the owner’s manual or on the device itself. If you remove dry cell batteries during storage remember to re-install them next spring. You also need to get in a habit of inspecting the fire extinguisher before each trip. Look to see if the arrow is pointing in the green area in the sight gauge. If it reads empty or needs charging replace it or have it recharged immediately. If it’s a dry powder type fire extinguisher the arrow pointing in the green doesn’t always guarantee that it will work. Every month you should turn dry powder extinguishers upside down, tap on the bottom of the extinguisher and shake it so the powder that settled on the bottom is released. Make sure you know how to operate the fire extinguisher too. A simple pre-trip checklist can serve as a reminder to test all safety devices prior to leaving on a trip. 7) Not maintaining the RV water system. The potable water system in your RV requires some maintenance to keep it trouble free. Something I’ve run into quite often is the complaint that there is a stale odor coming from the RV water system. When you return from a trip and you’re not going to use the RV for a while you need to drain the entire water system to prevent it from getting stale and musty. You should drain the water heater, low point water drains and the fresh water holding tank. Caution: Never drain the water heater tank when it is hot or under pressure. With the drains still open you can turn the water pump on for a moment to help force any remaining water out of the system. Do not let the pump continue to run once the water stops draining. Close all of the drains. If by accident you forget to drain the water system and you get that notorious stale odor all is not lost. You just need to sanitize the water system. Start by draining all of the old water out of the system, and then close all of the drains. Take a quarter cup of house hold bleach for every fifteen gallons of water that your fresh water tank holds. Mix the bleach into a one-gallon container and pour it into the fresh water holding tank. Fill the fresh water tank completely full of water. Turn the water pump on, open all hot and cold faucets and run the water until you smell the bleach at each faucet. Close the faucets and let it sit for about 12 hours. Drain the entire system and re-fill the fresh water tank with potable water. Open all of the faucets and run the water until you no longer smell any bleach. It may be necessary to repeat this process again to eliminate all signs of bleach from the water system. Once this is done it is safe to use your water system. It’s also a good idea to use a water filter at campgrounds and to keep bottled water on hand for drinking. If you don’t feel comfortable performing any of these steps you should take the RV to an authorized RV service center to have the maintenance performed. What are some of your RV owner maintenance mishaps?